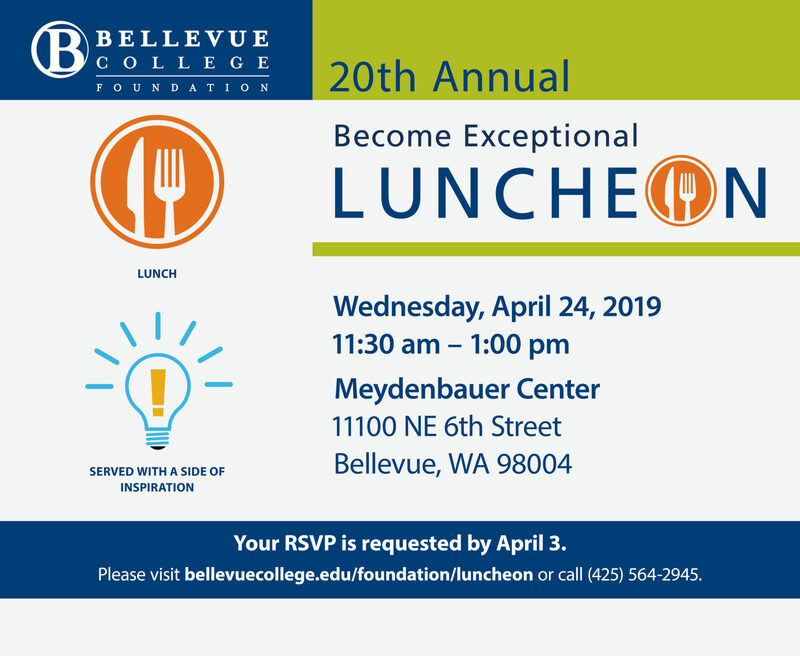 Join us for the Bellevue College Foundation Become Exceptional Luncheon on Wednesday, April 24, 2019! This annual event raises critical funds to ensure that anyone who dreams of obtaining a quality higher education at Bellevue College has the access and support to do it. Each guest is encouraged to make a contribution of $200 or more. RSVP today! International Airport. The most convenient off-ramp from I-405 is at NE 4th Street (Exit 13A). There is an HOV/Carpool exit at NE 6th Street from I-405 that exits directly to Meydenbauer Center. We look forward to having you at Meydenbauer Center. If the parking lot is full at Meydenbauer, please use the Griffin Lot or Bellevue Corporate Plaza for overflow. Download a printable PDF of driving/parking instructions here. Questions? Please contact Eva Murrell at eva.murrell@bellevuecollege.edu or (425) 564-2386. If you are unable to join us this year, please consider covering the cost for a student to attend by donating here.